With the growing demand for solar in the UK this has meant a rise in demand for qualified solar installers. Many other trades and people looking to start a career in solar installation have also been looking for suitable solar panel training courses in the UK. You can achieve MCS accreditation either coming from an existing trade such as an electrician or if you are looking to start a career as a solar contractor or get employment through an existing installer. As well as solar panel installation courses you can also get training in other areas such as solar roofing installation to specifically train no how to fit panels to a roof using different roof mounting systems. There are also introduction course for those who are completely new to renewable energy and solar and the requirements for MCS accreditation which you will need in order for your customer to claim the feed-in tariffs. Getting to a level where you are qualified and competent enough to install photovoltaic solar panels is going to require some level solar pv training depending on your current circumstances. Many renewable energy installation companies may only require training and guidance in order to obtain their MCS accreditation. At the other end of the scale you may be an individual who has not electrical or roofing experience and wants to find out what solar panel installation courses are available. You will probably want to find out what is required to become qualified in order to install solar photovoltaic systems on a self employed or contracting basis or in order to get paid employment with an existing solar PV company. If you are an individual and are looking to get qualified in order to become a solar panel installer then you will need to attain your MCS accreditation. To do this you will have to meet certain criteria to demonstrate your ability to be a competent installer. Your first decision is whether or not you want to go the route of being employed or self employed. The reason that you need to make this decision is that you as part of the MCS accreditation process you will need to at least be registered as a sole trader if you are not currently employed by an existing solar installer. We will not go into the details of self employment here, essentially becoming a sub-contractor but you can find out more information on the governments HM Revenue site. You will need to have attended a recognised solar training course. There are many training centres around the UK in places such as London, Manchester and Glasgow as well as many other more local training centre. As part of your solar panel installation training you will need to have completed an actual installation of a photovoltaic solar system as this will be part of your assessment. Finally you will need to demonstrate the use of a quality management system that covers the installer certification scheme requirements, the 19 clauses are laid out in the MCS 001 document. You can also get training on how to set up your own quality audit system. It may not be possible or practical for you to get qualified for all of the skills needed to install and commission a solar pv system. Usually you will either train as an installer who will actually fit the panels to the roof, many roofer retrain for this. Or if you are an electrician you can get qualified in order to connect the solar system to the mains grid. Electricians need to have their 17th Edition City and Guilds qualification and be Part P registered and they then have to attend a Solar PV course. Once you are trained and qualified you will be able to commission the install of a photovoltaic system. This means that the installed system will then qualify for the customer to be able to claim the feed-in tariffs which are the main reason the customer is installing solar in the first place. There are a number of centres around the UK that offer courses that can lead to MCS accreditation. You will need to find the right course to match your skills and experience. I have used an example of someone wanting to be trained in solar who has no previous experience but if you already work as an installer or have some existing skills then you will have a shorter path to accreditation. You can also obtain training through these licensed MCS certification bodies. You will need to be aware that there are fees payable for MCS which do not include any training that you obtain elsewhere. To maintain your MCS accreditation there are annual membership fees. There are also annual audits that are carried out. 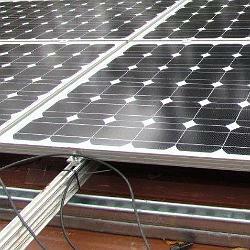 PASS offer solar panel photovoltaic installer courses and solar panel roofing courses. They specialise in electrical courses. Their training centre for solar is based in Stockton-on-Tees. The REA offers a variety of course including solar roofing installation, MCS training (how to become MCS certified not the certification itself), solar PV installation training and site surveying among others. They have two training centres in Wrexham and Durham. Trade Skills 4U have a number of solar installation courses covering various aspects of solar PV with the aim of giving you the evidence to then go on to apply for your MCS accreditation. The training centre is located in Crawley. Ploughcroft Training have a number of solar Pv related courses including solar panel installation, solar pv for electricians, solar pv for roofers and solar surveying among their courses on offer. They have a number of training centres such as Edinburgh, Newcastle, Huddersfield, Ashton, Stoke, Nottingham, Ipswich, South London and Bognor Regis but their solar courses are based in Huddersfield and Stoke. Trade skills offers a number of solar PV training courses including City and Guilds 2399/2372 solar PV training, NICEIC courses as well as Logic courses. There are quite a few locations available around the UK but the location will be dependant on the course that you want to take. Many of the courses offered expect you to already have a certain level of electrical competency.